Art Gene are delighted to present the 2017 artwork Textbook, by Benjamin Grosser within our Digital U Exhibition Series. The artwork, titled Textbook, is a browser extension that removes all images and video previews from the Facebook website. Textbook has been selected by Alejandro Ball, who recently exhibited with us as part of PILproject, and whom we have invited to be guest curator for the 2018 Digital U programme (being developed at time of writing). Subscribe to our Newsletter for further updates. Art Gene invite you to download and try out Textbook to experience a radically changed online space – free from the typical mash-up bombardment of images (follow the link below). Ordinarily a Facebook user can scroll rapidly through their news feed, absorbing visual information quickly – by adding the browser extension Textbook, which eliminates all images and icons, the user is left with only text to read. With text unaided by visual aids, the user can peer through the veil of marketing and other influence strategies employed. You may ask yourself, ‘would I have clicked on this post or have just scrolled passed it?,’ ‘Can I now spot fake news?,’ and ultimately, ‘to what point are the images on Facebook affecting what I “like” and where I click?’. Follow this link to the external Textbook website for full instructions and a guide to installing Textbook onto your browser. It’s free! Alternatively, you could find out more about Textbook and Ben Grosser’s artwork on Ben’s own website. NB: The artwork Textbook is fully controllable by the user, with the inbuilt ability to activate or deactivate this browser application as desired. Additionally, the Textbook application is fully uninstallable. Art Gene provides this link in good faith (and have tested it out – it’s great!) , however please note we can not be held responsible for the content of any external sites. Art Gene’s 2017 and 2018 Digital U exhibition programme curators Ruth Pringle (Art Gene) and Alejandro Ball (Ali Ball) spoke on Facebook with artist Ben Grosser about his current online Art Gene exhibition Textbook. Read about our conversation here. 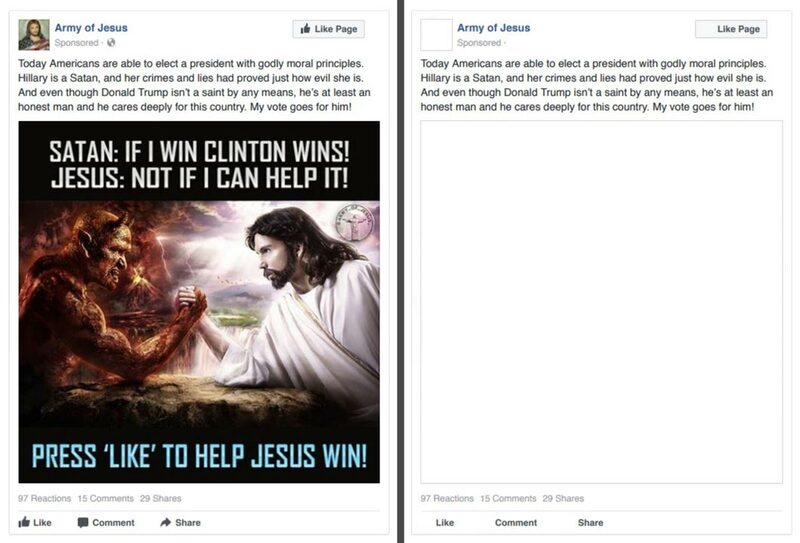 “I found myself wondering—particularly after the 2016 US Presidential election—how images on Facebook influence the way we act and interact in social media. For example, are we more prone to “like” a post that has an image? Further, are we less likely to read the text that accompanies an image we’re drawn to, or less likely to scrutinize its origin as long as we enjoy what we see? As part of this questioning, I also noticed just how much of my Facebook news feed was made of images (as opposed to text, or links). So as an artist who writes code, I wanted to create a work that gets in between the user and the system, that lets anyone see how Facebook looks—and feels—without the images. In my own experience, not only does it refocus my attention on the text, it also illustrates just how little is left when the images are gone”. I first came into contact with Benjamin’s artwork at London’s AreByte Gallery in Hackney Wick (and got a nifty tote bag to remember the occasion!). ‘GoRando’, similarly to Textbook, required the user to download a browser application, which would enable an operation to randomise all of the user’s Facebook reactions to posts in an attempt to confuse the Facebook algorithm. It was a memorable piece highlighting the artificial nature of this social platform and public space. Such interventions are characteristic of Benjamin Grosser’s practice; challenging audiences, members of the public and computer users to see past fabricated constructs presented to us on social media platforms like Facebook and comprehend what could even ultimately be said to be their true purpose: the commodification of human behaviour and marketing potential that every one of our interactions presents. Artist Benjamin Grosser creates interactive experiences, machines, and systems that examine the cultural, social, and political implications of software. Recent exhibition venues include Arebyte Gallery, London, Museu das Comunicações, Lisbon, Museum Ludwig in Cologne, and Galerie Charlot in Paris. Grosser’s recognitions include First Prize in VIDA 16, and the Expanded Media Award for Network Culture from Stuttgarter Filmwinter. His writing about the cultural effects of technology has been published in journals such as Computational Culture, Media-N, and Big Data and Society. Grosser is an Assistant Professor of new media at the School of Art + Design, and co-founder of the Critical Technology Studies Lab at the National Center for Supercomputing Applications, both at the University of Illinois at Urbana-Champaign, USA.